James MadisonIn 1773, it came to the notice of a weedy, bookish, young Virginian that some Baptists were languishing in a nearby jail. For many years before, as he well knew, magistrates had meted out fines and prison sentences to religious dissenters from the colony’s Anglican establishment. But this episode struck a nerve, prompting the young gentleman to condemn what he called the “diabolical, hell-conceived principle of persecution.” Thomas JeffersonPerhaps that was because it occurred close to his family’s plantation, or perhaps, because the young man had recently graduated from Princeton, where he had been steeped in enlightened learning, including the ideas of John Locke. Whatever the reason, the imprisonment of local Baptists marked a turning point in the life of James Madison. It steered him toward a career in politics as well as a lifelong partnership with his fellow Virginian, Thomas Jefferson. Over the course of many decades devoted to public service (including a combined 16 years in the presidency), these two men would decisively shape the relationship between church and state in the new American republic. It marked a signal victory for Madison and Jefferson. In their view, civil governments should not only tolerate all forms of religious belief—neither penalizing nor encouraging any particular faith—but also uphold the principle, as Jefferson’s bill declared, “Our civil rights have no dependence on our religious opinions, any more than our opinions in physics or geometry.” Specifically, candidates for public office should not be judged based on whether they “profess or renounce this or that religious opinion.” But rougher sledding lay ahead for making their ideals of religious freedom those, which would guide an entire nation. But (to indulge in a riot of understatement), the adoption of the First Amendment did not settle the matter. While unequivocally affirming liberty of conscience as a fundamental private right, it pronounced ambiguously on the separation of church and state and the relationship between religion and society. Did the First Amendment’s restrictions concerning religious establishments mean that Congress—as well as the federal executive or judiciary—might encourage religion in ways that did not disadvantage any faith groups? Could the state governments (many of which still had religious establishments in 1791) continue to mandate taxpayer support for Christianity in general or for any religious denomination in particular? And to what extent could religious ideas and observances figure in the conduct of civic life? Today those questions loom large in the United States, as controversies rage over prayer and the teaching of evolution in the public schools, the posting of the Ten Commandments in courtrooms, and the launching of “faith-based initiatives” by the executive branch. But the founding generation could not foresee our concerns: what consumed them was answering the needs of their present and avoiding the pitfalls of the past. Those steeped in the ideals of the Enlightenment were determined to ensure that the religious wars which had wracked Europe would not engulf the new republic and that its clergy and churches would not acquire the wealth and influence which would enable them to play a prominent role in civil government. At the same time, many Americans who cleaved to Christian orthodoxy—especially those who dissented from former or current religious establishments—were determined to ensure that no denomination would enjoy the unfair advantage of government support. Both groups supported the separation of church and state, with Virginia’s bill for religious freedom providing the model. In the decades after 1790, all of the states abolished taxpayer support for religion and religious tests for office-holders, and state courts, deeming that churches were private institutions, ruled that religious bodies could not receive public funding to provide education or poor relief. Even so, those changes proceeded slowly: religious tests persisted in some states until well into the nineteenth century, and religious establishments lingered in New England, with Massachusetts maintaining its Congregationalist “Standing Order” until 1833. Designating the appropriate role of religion in the early republic’s civic life also presented a challenge. Most of the Founders believed that religion would promote public morality, which in turn would strengthen both republican society and government in the United States. That being the case, what constituted an appropriate inclusion of religious ideas and rituals in the conduct of civic life? In wrestling with that question, presidents from Washington to Madison played a delicate game of brinksmanship. All of them strove to keep religion from becoming the fodder for controversy by affirming that expressions of spirituality had a legitimate place in the public square while also upholding what they regarded as a due separation between church and state. In their efforts to strike the right balance, George Washington and John Adams proclaimed national days of thanksgiving and fasting during their administrations and voiced no objections to the appointment of salaried Congressional chaplains, who opened legislative sessions with prayers. In their public addresses, too, they often expressed confidence in the power of divine providence to guide the new republic. On the other hand, a treaty negotiated with the Muslim Barbary States during Washington’s administration declared, “As the government of the United States of America is not in any sense founded on the Christian religion…it has in itself no character of enmity against the laws, religion or tranquility of the Mussulmen [Muslims]...” Similarly, Thomas Jefferson, even though he refused to proclaim national thanksgivings and fasts during his presidency, made efforts to conciliate orthodox Christians. He approved bills authorizing Congressional chaplains and granting financial aid to Protestant missions for Indians in the Ohio valley; he regularly attended Sabbath worship services conducted in Congress, and, in his second Inaugural Address, called upon Americans to join him in prayer. Even James Madison, who objected to the appointment of chaplains to both Congress and the military, relented during the darkest days of War of 1812 and declared a national day of fasting. In short, while the Founders spoke with one voice in affirming religious liberty as an inalienable private right, it is hard to discern a consensus among them about how to define the appropriate separation of church and state and the proper role for religion in civic life. Indeed, the only common intent among the Founders may well have been to avoid pronouncing too clearly on those matters, because religion, like slavery, held the potential to become a deeply divisive issue in the fragile union they had hopefully named the “United States of America.” The federal government faced the daunting challenges of paying off the war debt, contending with Indian resistance to westward expansion, and fending off the efforts of Spain, France, and Britain to strengthen their empires in North America. With a national agenda so crowded with pressing demands, the course of prudence dictated leaving religious matters mainly to the states. But in fact, the withering of religious establishments in the wake of the American Revolution proved to be the making of bible-based, evangelical Christianity. By the middle decades of the nineteenth century, only a minority of Americans adhered to Unitarianism and other rationalist religions, but hundreds of thousands had embraced evangelical Christianity. And those revival converts of the Second Great Awakening were investing their energies in an ever-expanding number of voluntary associations promoting moral and social reform, which immeasurably strengthened the influence of evangelical Protestants on public opinion and political culture in the United States. Please also see: “Evangelicalism, Revivalism, and the Second Great Awakening,” by Donald Scott and “Deism and the Founding of the United States,” by Darren Staloff. While many of the Founders discovered to their dismay that religion was the “third rail” of early national politics, teachers can tackle this topic without fear of being fried. In my experience, the best approach is to acquaint students with the broad historical context, to introduce them to a selection of sources, and then to raise probing questions as class discussion ensues about how the principal architects of the early republic envisioned both the ideal relationship between church and state and the ideal relationship between religion and society. Drawing that latter distinction will help to sharpen students’ thinking and will also foster more productive exchanges than asking whether “America was founded as a Christian nation,” a question as vague as it is polarizing. Please also see: “Church and State in British North America,” by Christine Leigh Heyrman. Targeting sources for class discussion is “easy cheese,” so you need only to choose among many choice options to ensure a delicious exchange of ideas. First, there’s Madison’s “Memorial and Remonstrance,” best when paired with Jefferson’s “Virginia Act for Establishing Religious Freedom,” because both will help students to appreciate why some contemporaries regarded their religious liberty as a radical innovation. Be sure to draw students’ attention to how shrewdly Madison framed his arguments to appeal to both “enlightened” and evangelical Virginians. To bring class discussion up to the present, ask your students to reflect on the ways in which candidates’ religious beliefs now figure in electoral campaigns and influence their prospects winning for voter approval. 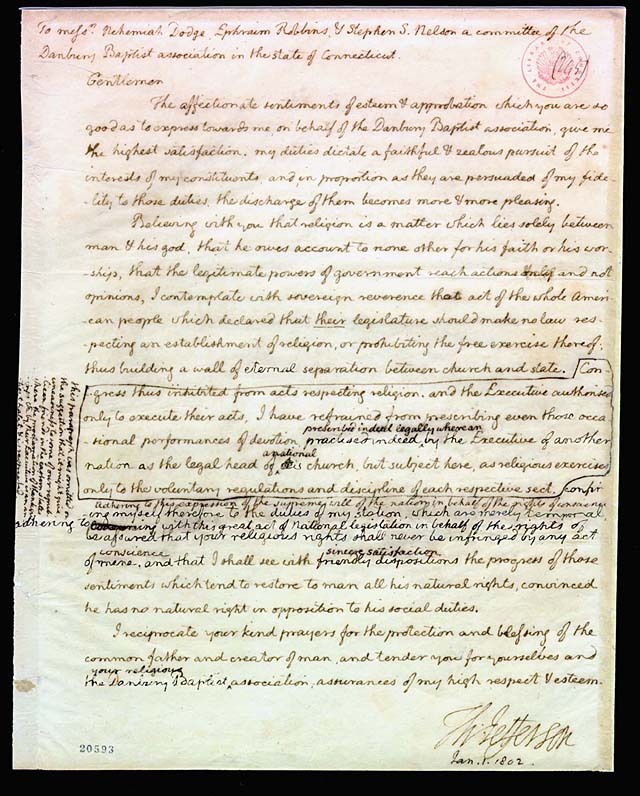 letter to the Danbury BaptistsUntil the end of the twentieth century, historians and jurists (including Supreme Court justices deciding landmark cases) understood Jefferson’s letter to the Danbury Baptists as a principled affirmation of his views on church-state relations. But in 1998, an FBI laboratory analysis revealed what Jefferson had omitted from his first draft in the course of composing his final draft. Those now-recovered deletions have convinced some scholars that Jefferson’s main motive in writing to the Danbury Baptists was to outfox his Federalist political opponents, who charged him with being “a howling atheist,” rather than to articulate his intellectual convictions about the separation of church and state. And some conservative jurists and politicians have claimed even more, construing the FBI findings as evidence that Jefferson did not intend to erect an insurmountable barrier between church and state. 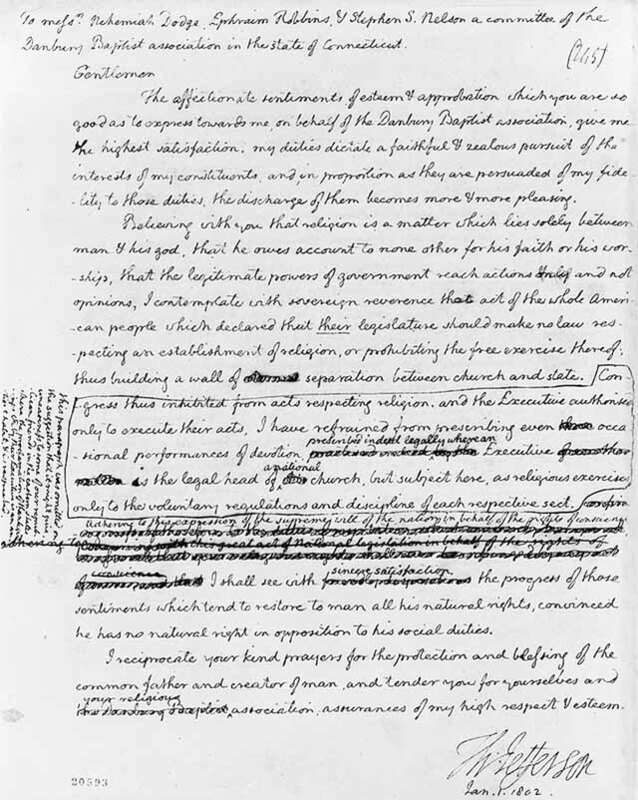 Let your students decide, once they’ve tucked into the original and final drafts of Jefferson’s letter. They’ll get an intellectual jolt from reading over his shoulder, and you might engage them in discussing why some conservative evangelicals have come to hold views of church-state relations, which differ significantly from those of the Baptists back in the day, when they were gifting big cheeses to the likes of Thomas Jefferson. The debate swirling around Jefferson’s letter to the Danbury Baptists reflects a wider controversy about the intentions of the Founders still being waged among scholars, jurists, and politicians. If you’re looking for a good place to begin or only wish to dip your toe in the ocean, turn to the scholarly slugfest featured in “Thomas Jefferson’s Letter to the Danbury Baptists: A Controversy Rejoined,” William and Mary Quarterly, 3rd ser., Vol. 56, No. 4. (Oct., 1999), 775–824. And for a fresh and provocative take on the subject, check out Johann N. Neem, “Beyond the Wall: Interpreting Jefferson’s Danbury Address,” Journal of the Early Republic, Vol. 27, No. 1. (Spring, 2007), 139–154. If you need a quick overview of the entire controversy, here’s how the debate cashes out. On one side are those who contend that the principal architects of the early republic shared a single “original intent”—which did not include building a high and impregnable “wall” between church and state. On the contrary, they argue that the Founders meant for the First Amendment neither to impose a strict separation of church and state nor to prohibit federal support for religious institutions, but only to prevent government from favoring one Christian denomination at the expense of others. For an elaboration of those arguments, see Richard John Neuhaus, The Naked Public Square: Religion and Democracy in America (1984) and Philip Hamburger, Separation of Church and State (2002). On the other side of the debate are those who posit that most of the Founders favored a more rigorous separation of church and state—erecting a “wall” high enough to protect individual liberty of conscience and to prohibit both religious establishments and federal support for any denomination, but one low enough to allow for the expression of religious sentiments and values within the public square. Skeptical of recovering any uniform “original intent” among the Founders, members of this camp also point up the diversity of the public pronouncements concerning the role of religion in the civic culture of the new United States. The best brief synthesis is Gordon S. Wood, “American Religion: The Great Retreat,” New York Review of Books, June 8, 2006, 60–63, but if you’ve got a little more time, by all means settle in with Edwin S. Gaustad, Without King, Without Prelate (2nd ed., 1993). If you wish to delve even deeper into this timely topic, recent books that beckoned me to turn the page and to think harder are John G. West, Jr., The Politics of Reason and Revelation: Religion and Civic Life in the New Nation (1996) and Mark Douglas McGarvie, One Nation Under Law: America’s Early National Struggles to Separate Church and State (2004).